I once had been to Golden Palm Resorts, Bangalore, India. 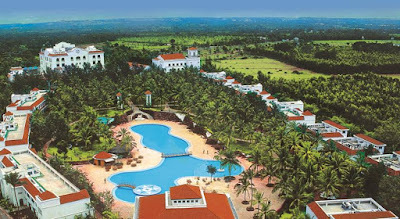 This is one of the high class resorts in India and up to international standards. The Golden Palm resort is star category. This property / resort owned by a Bollywood veteran actor late Sanjay Khan. However, no idea about its owner at the moment. There are many things to write about this property but I like one of them is, huge swimming which I have never ever seen anywhere in Bangalore's or Goa's and other cities' resorts, where I had been so far. This is one of the best swimming pools resort in Bangalore India. If you are eager to know where to swim in India and which is the best places to swim in Bangalore or India then this is one of the best places in Bengaluru to go for a day out and enjoy the swimming pool aside. Would you like to see some of the beauties of the Bangalore? If so, here you go for the same. Find the photos or images of largest swimming pool in Golden Palm Resorts, Bangalore, India. You may also find other images or photos at PhotosImagesStylus blog. Nice information regarding the resort. Bangalore or Bengaluru, whichever way you like it, is the capital city of Karnataka which is spread over an area of over 700 sq km, it is known as the IT Capital of India also the tourist attraction places. Recently I had visited there with the help of a well-known travel agent fever pitch holidays and enjoyed alot.